Pioneer unveils a pair of IMAX Enhanced AV receivers | What Hi-Fi? Pioneer has taken the wraps off a pair of new home cinema receivers. Available in black or silver and due to go on sale in May, the VSX-LX504 (£1200, pictured above) boasts 215 watts per channel, while the VSX-LX304 (£900) weighs in with 185 watts per channel (both measured at 6 ohms, 1kHz, THD 10%, 1ch driven). 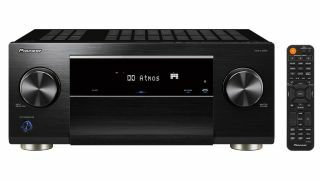 They're both 9.2 channel AV receivers, with Dolby Atmos (7.2.2 or 5.2.4) and DTS:X support. They're also the first Pioneer models to be certified IMAX Enhanced. IMAX Enhanced is a new licensing and certification home entertainment programme, born out of a partnership between IMAX and DTS. It's claimed IMAX Enhanced versions of 4K HDR movies and TV programmes should look their best when viewed through compatible kit. These Pioneer receivers won't support IMAX Enhanced out of the box, though. You'll have to wait for firmware update to unlock this particular feature. They boast seven HDMI inputs and two HDMI outputs with full 4K and HDR support. They can also upscale to Ultra HD resolution where required. A wealth of wireless features are on the menu, including Chromecast built-in, wi-fi, Apple AirPlay 2, Bluetooth and DTS Play-Fi. You also get a good spread of music streaming services built-in, including Amazon Music, Spotify, Tidal and Deezer. There's also quad DSD and 24-bit/192kHz hi-res audio playback with FLAC, WAV, AIFF, ALAC files all supported. The Pioneer HTP-076 (£500) combines a 5.1 speaker package with a 150 watts per channel (6 ohms, 1kHz, THD 10%, 1ch driven) surround sound receiver. It too is Dolby Atmos and DTS:X compatible and comes with four HDMI inputs, one HDMI output, and the obligatory 4K and HDR pass-through. Like the AV receivers mentioned above, the HTP-076 is available in black or silver and goes on sale in May.